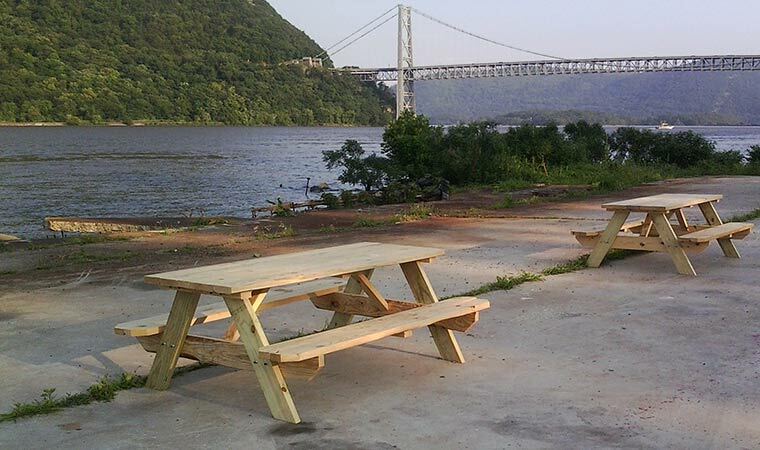 Picnic tables at Scenic Hudson Mine Dock Park. HIGHLANDS, Orange County (2 acres)—This park embodies the saying that “good things come in small packages.” It offers astonishing, sweeping vistas of the Hudson Highlands right from the shore of the river. In addition, it provides town residents with their first public access to the Hudson since the West Shore Railroad cut them off from the water in the late 1880s. For both of these reasons, the land had been a conservation priority of Scenic Hudson’s for nearly 30 years prior to our 2013 acquisition of it. For decades site of a popular marina—and named after its 19th-century use as a loading dock for inland iron mines—Mine Dock Park offers a great place to enjoy a windswept picnic, launch a kayak or simply admire the enveloping splendor of the Hudson Highlands. Scenic Hudson transferred ownership of the park to the Palisades Interstate Park Commission in 2016. It is managed by the Town of Highlands.